Listen as a client, Dannia, learned about God’s love and her salvation by coming to Life Centers. This hunger for more knowledge about Jesus was also evident in her young daughter, which pushed Dannia to seek a closer relationship with Jesus. Our tagline, “Choose Compassion” is so much more than a tagline. It is something we set out to do every single day for every single person that walks through our doors. We want people to want to come back again and again. We want them to feel comfortable talking to us, knowing we will be unbiased listeners, not placing judgment. So many people just need someone to listen, show genuine concern, and offer support and solutions. At times, the stories we hear can be difficult and full of sorrow. Many times, it’s hard to know the right thing to say, but if we lean on the Lord and rely on Him to speak through us, often times the right words come pouring out; words offering hope. Recently, a young lady and her boyfriend visited one of our centers. Jessica* had been seen twice this year by Karen* who happened to be working when the couple came in. Karen took her back to a counseling room and determined she was there for a pregnancy test. The test was negative. But a pregnancy test wasn’t the only thing Jessica came in for that day. Tearfully, she said to Karen, “I came here for you to pray with me.” Somewhat shocked, as that isn’t something we hear very often, Karen asked Jessica if this was something her boyfriend should be a part of, or if she would like to be prayed for alone. Stating her boyfriend should be involved, Matt* came back to the counseling room. When Karen asked the couple what they needed prayer for, Jessica replied, “Our life together and for our relationship.” The couple was holding hands, crying as Karen prayed for them. 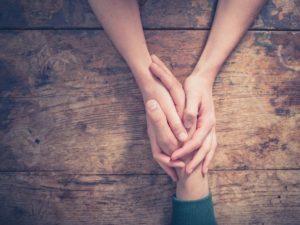 Karen encouraged them to move toward God and to put Him first in their relationship, forsaking all things that are interfering with a relationship with their Lord and Savior. God is moving in this young couple’s lives. They sought prayer and guidance and knew where to go. This is such a powerful example of what Life Centers is. A place of compassion, hope, and support. Are you looking for a way to show support and offer hope to members of your community? If you are interested in volunteering at one of our centers, please email Tammy Johnson at tjohnson@lifecenters.com. Executive Director Tom Shevlot talks Open House for new Hamilton County Center and upcoming Celebration of Life Banquet featuring keynote speaker Lou Holtz. 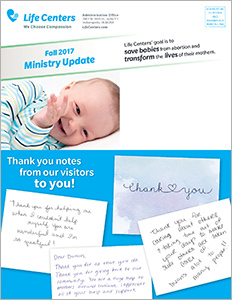 Here is the fall 2017 ministry update. Click on cover image to expand. A large part of our ministry is throwing baby showers. This might surprise you, but some of the women who come to our centers do not have family support for their new babies. 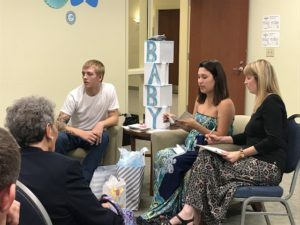 Sometimes, the family is not excited about the pregnancy, the significant other is not supportive of the mom’s choice to keep the baby, or the new mom simply doesn’t have anyone to host a baby shower for her. We want to show encouragement to the young woman who just found out she was pregnant. Baby showers can supply moms-to-be with the basic items they need to care for their little one. Something as simple as a baby shower can give a new mom confidence to properly care for her child. Avrie came to Life Centers looking for support and information. She is excited to meet her son, Alexander, very soon, and says she will be bringing him into the center to meet everyone! Recently, Burge Terrace Baptist Church hosted a baby shower for Austin, Avrie, and baby Alexander. 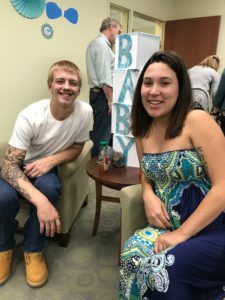 More than fifty men, women, and children were in attendance to show love to this couple and their baby. Baby Alexander will be well supplied for his first year because of the outpouring support shown to Avrie and Austin. If you are interested in hosting a baby shower email, info@lifecenters.com. The pregnancy center in your area will connect you with a client in need, and you can host the event at your church or local pregnancy center.